6:45 a.m. and Little Miss (age 6) is in my room asking if it’s time to go to California yet. ‘No, net yet,’ I reply, ‘but I’ll get you some juice.’ And I slowly rouse myself out of bed knowing that I still have yet to pack my own items, organize the last of my computer files, tour merchandise and lastly load the van before heading out on my first solo tour. As a recording artist for many years who put things on hold to make a couple of little people, I’m just getting back to the work of being a performer as well, and today I’m packing up my Littles and my Dad and we’re doing the U.S. West Coast where I’ll be playing six shows and one open mic along the way. By 11:10 a.m., we pulled out of the parking garage and we’re on our way. Within no time at all (just over 1 hour) we were in line at the Peace Arch US Border. Sweet Petite (age 4) is done with the waiting before we even arrive in line and it takes another 80 minutes before we pull up to the Guard where I hand him my golden ticket my P2 Visa allowing me to tour down the West Coast as a Canadian into the United States. I’m beaming with pride and so is Little Miss as she hollers from the 2nd row of our minivan, ‘You can come to the show if you want!’ ‘My mom is a singer’ ‘I can give you a CD’. 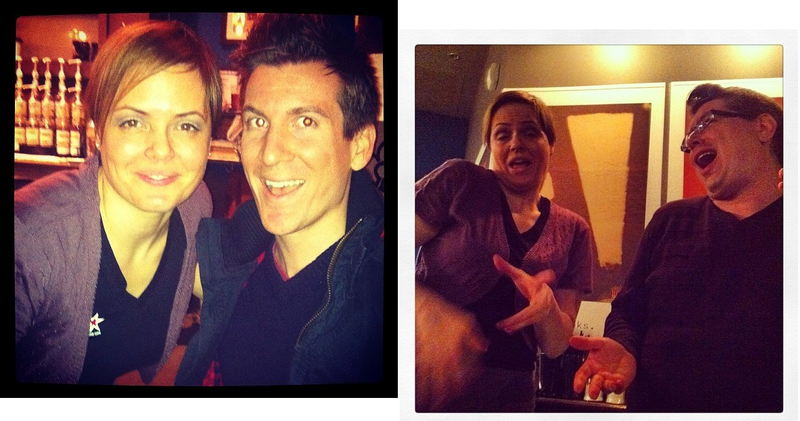 Of course her antics, as adorable as they are win him over, but as expected we are still given the adjudication ticket. So we pile out of the van and into a 2nd waiting area where even the line for the bathroom is at least 30 minutes long and now on foot we are hustled into another line. Sweet Petite lasts about 5 minutes before she’s treating the surrounding area as a play structure including the bodies near by as resting posts and possible boomerangs. 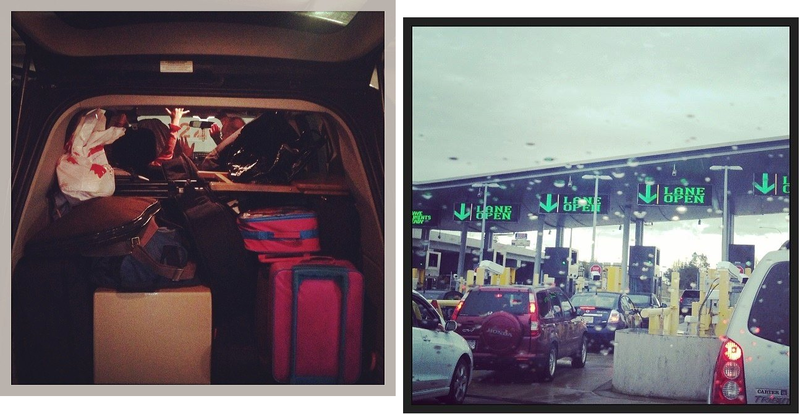 As we all have a bit of minivan cabin fever going on, (and this is day 1 within the first 3 hours I might add!) my patience for their excitement is wearing thin but now is not the time to indulge my need to BOSS my children into respecting their surroundings. The key is to remain calm and not look like a terrorist parent moonlighting as a rockstar en route, which at this very moment I feel like I am. Border Crossing Guards jobs’ are to not look like they’re having any fun, unless it is at your discomfort I assume, but Little Miss’ earlier invitation to the first guard we encountered has trickled into this new experience as this same guard has been transferred inside and is now sitting right next to the guard that is checking my golden ticket and subsequent paperwork. He brags that he was invited to the show and in response Little Miss and Sweet Petite both try to scale the counter like a mountain to extend the invitation to our new gatekeeper. He can’t help but smile. Though these antics have me hearing loud off key choirs singing in my head like fingers on a chalkboard, they seem to inspire the songs of angels upon others’ who’s days are brightened by these very same shenanigans. Come to think of it, has anybody ever really parented an angel, a real angel? With so much energy and power I can’t imagine it would be easy! I can tell you from the parenting shoes of my little ‘angels’, it’s not. Once released from this latest Little's pageant, we’re off. Tacoma isn’t that far from North Vancouver, but it takes us just shy of 7 hours door to door. 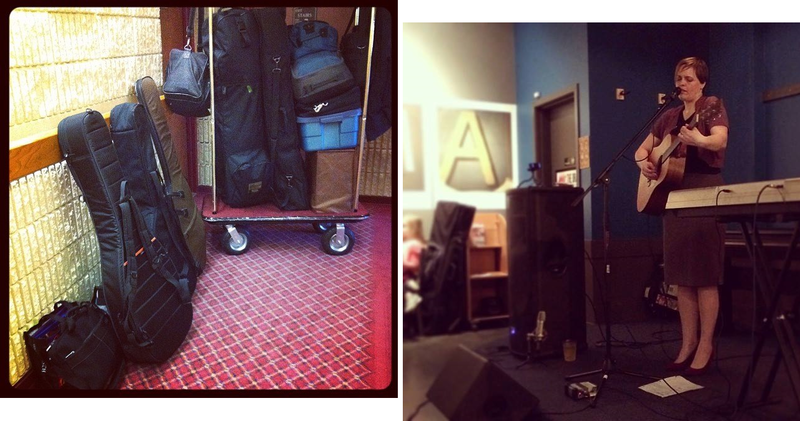 We check into our hotel at 6 p.m., unload the heaps of gear not coming to the show with me, as Joe (my bandmate) won’t be joining me on stage until Tuesday night in San Francisco at 50 Mason Social House and any good touring musician knows or has heard you NEVER leave your gear in the van overnight. I jump into my new black Jody Quine t-shirt, slip the Littles into their Jody Quine t-shirts and my Dad who is with us to watch the girls while I’m working proudly dons his. We are a branding machine ready to take Metronome Coffee by storm! The venue is an open space with high ceilings and there are already some familiar faces of friendly fans from facebook there to greet me. How cool is that! By 8:05 Thene at Metronome takes to the stage to introduce me and Honorius of Catching Sound has his STAGEIT show he’s streaming of my performance ready to go LIVE. My all day coughing has decided to give me a break for this evening’s show (Thank Goodness! I mean who gets a chest cold before going on tour!) and I begin. I should mention that Little Miss has been looking forward to running the merchandise table for this tour since the whisper of any sort of items to be sold has crossed her lobes. I’m barely finished the first song before she is standing up and asking for everybody’s attention. ‘EXCUSE ME EVERYBODY, that song is on my Mom’s CD that I’m selling over here’. This speech, or several versions of it, happens between all of my songs and by the end of the show both of my children are making a habit of hanging out on stage during my performance. I have to shoo them off often and gently express that it’s ‘My turn.’ There’s no need for Terrorist Parenting to come into play here. At one point during Come Back Home, Sweet Petite is full on doing laps. Walking onto the stage behind me while I play, around and down onto the floor, passing in front of me on camera, and then back up. Just as I’m about to call ‘Security’ with a twinkle in my eye she stops dead in her tracks on stage next to me and starts singing the lyrics of the chorus back to me. "I’ve always seen it in your eyes. you’re going to be amazing, when you make your mark on the world, I will be here waiting for you to come back home." Next 2 dates on her Seven Tour! Did I say ‘Security’? I meant ‘Get this girl a mic! Get her anything she wants!’ and I am one with the Border Crossing Guards this morning completely besotted by my children and their love and support for me and my music. My angels. My angels who climb the walls, holler at a room full of strangers, bounce incessantly on the spot, ride the hotel luggage trolley like cable cars, storm the stage during my shows, tell my fans to buy stuff and love me like crazy. My angels. Today we drive to Eureka. It will be an over 10 hour drive but the following morning we’ll check out the Redwood Forest before heading to San Francisco for the night and on Tuesday night I get to play again! I can’t wait. 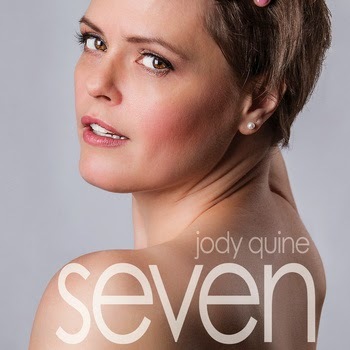 Jody Quine is a recording artist out of Vancouver, Canada, on tour down the US West Coast in support of her new EP, Seven. www.youtube.com/jquine - you can check out pre and post show videos here!